Manufacture point out check the electric hoist main, control circuit of electrical damage, broken line or poor contact, but also makes the motor phase can not work properly. In this case, the need to check the main control loop, In order to prevent the main and control circuit for the three-phase motor power supply burned motor, Or hoist motor with electric operation, produce harm, Make sure the hoist motor is disconnected from the power supply line, only to the master, the control circuit to send electricity, Then start and stop switch, check and analyze the working status of the electrical equipment and circuit, for electrical appliances with title or line to repair or replacement, When the main and control circuit is confirmed to have no obstacle, the test can be run again. Check whether the power supply system is powered to electric hoist, products are widely used in machinery, metallurgy, electric power, railways, water conservancy, ports, terminals and other industries, product performance, quality and reliable, well received by users. The main products are: all kinds of electric hoist, wire rope electric hoist, single beam electric hoist, explosion-proof electric hoist, safety sliding contact line, crane, jib crane, single beam crane, gantry crane, bridge crane. We should check whether the grid voltage is too low, the starting torque is proportional to the square of the voltage. The acceleration torque can not overcome the load torque and can not reach the operating speed, Should be appropriate to improve the grid voltage. If the electric hoist motor terminal voltage is lower than the rated voltage of more than ten percent, motor starting torque is too small, hoist can not move the goods, and can not work, Check, use multimeter or voltmeter measurement voltage of the motor input. Second, check whether the power fuse is broken, if the broken phase, then the single phase start, The starting torque is zero and the electric motor can not roll, Fuse should be replaced. Load is too large or drive shed machinery fault , generally thought electric power electric block matching is reasonable. 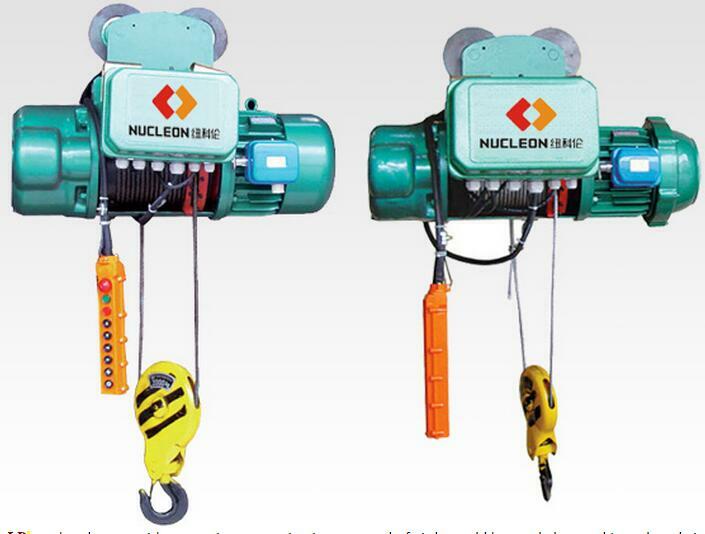 Lifting heavy objects can not be overloaded, if the electric hoist can not roll, first remove the load, If the electric performance of the normal start, The gearbox and other have a fault, Should be checked by dragging the structure, clear the fault.